There are plenty of VR apps available on Google's Play store and iTunes, some which are dedicated to the medium and some, like YouTube, that have additional VR capabilities and work with headsets. Virtual Reality is the next big thing, with the HTC Vive and Oculus Rift readily available, and PlayStation VR coming out later this year. But what about those of us without high-end VR headsets? Don’t worry, as you can buy a number of cheap VR viewers that utilize your mobile device’s internals and display to provide you with a decent VR experience. Here, we showcase the VR Store app that collects all of the best VR apps and other VR content into one place for your enjoyment. If you, just like us, are tired of searching and scavenging through the internet for the latest best and coolest VR apps, 360 VR videos and other VR content, we found the app that provides a solution for this time consuming task. 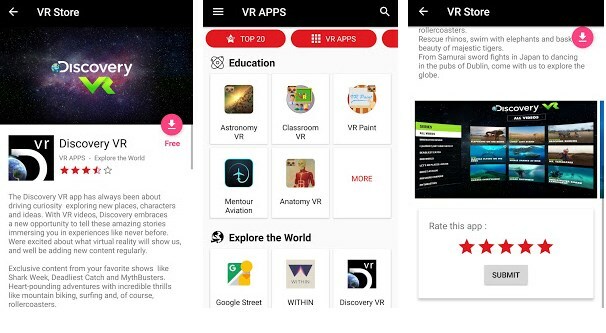 The VR Store is a VR platform app, developed for android & iOS devices, which holds an immense collection of VR content like the best VR apps, VR games, 360 VR videos and other content all neatly organized and catalogued for easy access. With the VR Store, instead of searching for the VR apps scattered around the Google Play Store, you can discover your new favorites within seconds. The VR Store is a place where you can find all the jump scares, 360-degree VR videos, flying and driving VR simulators, VR video games and VR social apps. They are all categorized in apps and 360 videos categories. 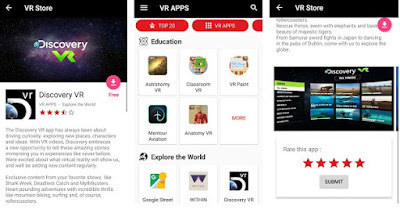 The app also has a top 20 VR apps section that users can use to find which apps are amongst the most popular at the time and what most VR headset users are enjoying. The number of VR apps and other VR content within the VR Store grows and expands as time goes with regular updates so all the newest VR apps and content are included. If you want to give the VRStore app a try you can download it for free at the Google Play Store or App Store today.